If you are looking for the best kids’s sewing machine which is compact and will get basic stitching work done without spending much, the Michley is well worth popping on your shortlist. The Michley LSS-505 can work out as a great machine for your kids if they are first timers at the art of sewing because the machine is so lightweight and easily portable. With this model, sewing is limited to basic mending and normal fabrics. It will be ideal if you want to teach your kids how to sew quilts, hem or sew linens. It is a multipurpose sewing machine with 8 built-in stitches and it can cope with forward and reverse stitching. It includes 2 bobbins, foot pedals, an AC adaptor and 2 thread spools. It also features sleeve sewing ability, 2 speed settings and an LED sewing light to brighten up your sewing work area. 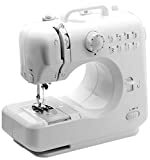 This sewing machine is recommended for basic stitching tasks and is more than enough for your kid when they are starting out. After using it for some time (and if you feel your kid needs an upgrade) you can easily invest in a more advanced model. The foot pedal and adapter should come supplied with the machine. Did you not get this with your sewing machine?